No hurry, any time in the next 5 minutes is fine. 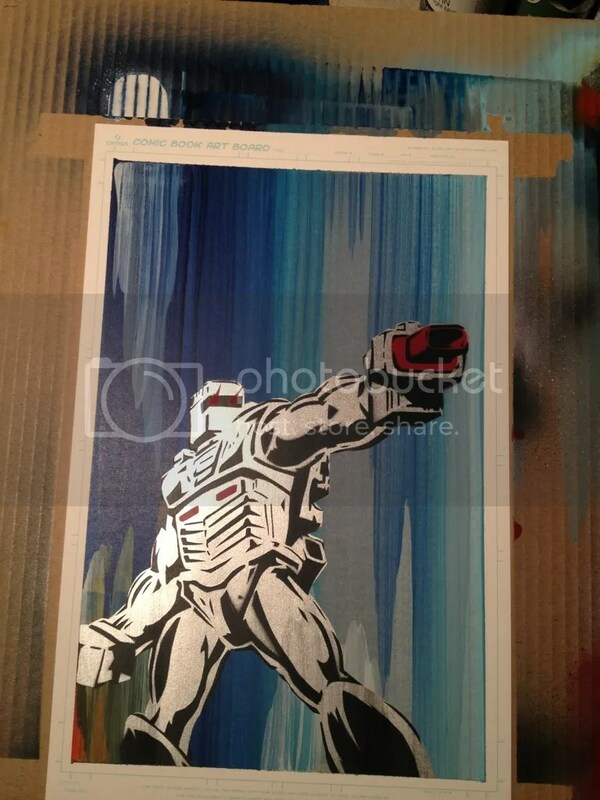 So, here’s my take on the classic ROM #1 cover. 11″x17″ on comic board. 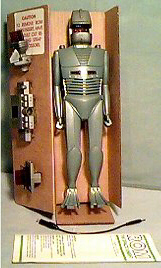 “Rom The Space Knight” was a toy co-created by Bing McCoy, Scott Dankman, and Richard Levy (US Patent #4,267,551). It was sold to Parker Brothers, and was the inspiration for the comic bookseries. The toy was originally called COBOL (after the programming language,) which was later changed to “Rom” (after ROM, read-only memory) by Parker Brothers executives. The toy set a precedent for the game publishing company, which up until that time had only ever produced board games. As this was a new venture for the company and given that electronic toys were still very new, a decision was made to produce the figure as cheaply as possible. As a result, the final product had very few points of articulation, and twin red LEDs served as Rom’s eyes instead of the originally envisioned green, which were more expensive to produce. The Rom toy in box. ROM is trademark and copyright Parker Brothers (brand of Hasbro) 1979. ROM was licensed to Palitoy in the UK to extend the “Space Adventurer” line of Action Man, appearing in their 1980 catalog. To build interest in the toy, Parker Brothers licensed the character to Marvel Comics which created a comic book featuring Rom. The comic expanded on the premise that Rom was a cyborg and gave him an origin, personality, set of supporting characters and villains, as well as interaction within the Marvel Universe. The comic was written by Bill Mantlo and initially illustrated by artist Sal Buscema. Ultimately, the toy failed and only sold 200,000 to 300,000 units in the US, with creator McCoy blaming the failure on poor packaging and marketing. Parker Brothers subsequently abandoned the line and returned to manufacturing board games. Regardless and with some irony, the comic book outlasted the toy which it was created to support. The series lasted for 75 issues over a seven year period, with Rom’s regular encounters with mainstream heroes and villains establishing him as part of Marvel continuity. As Marvel Comics no longer possesses the licensing rights to Rom from Parker Brothers, the character is not allowed to appear in his armored form. And for those of you who don’t know who Mr. Spacely is. Cosmo G. Spacely is a cartoon character in the animated series The Jetsons. and the main antagonist. In the original series he was voiced by the late Mel Blanc. Frank Welker voiced a teenage version of Mr. Spacely in the Jetsons Christmas Caroland Jeff Bergman voiced Spacely in some scenes in Jetsons: The Movie after Blanc’s death, as Blanc died during the production of Jetsons: The Movie. This means the character has the distinction of being the last character to be voiced by legendary voice actor Blanc. Spacely is president of ‘Spacely Space Sprockets’, where George Jetson works. Mr. Spacely is the stereotypical tough boss, constantly yelling at George for his perceived poor work performance. A typical videophone call from Spacely starts with him yelling “JETSON!! !” at the top of his lungs. Mr. Spacely’s aggressive behavior is in contrast with his extremely short, rotund stature, the three hairs combed over his bald head, and his Adolf Hitler-like mustache. Not content with making George’s worklife difficult, Mr. Spacely often found excuses to get involved in George’s personal life, increasing his employee’s already high stress level. His capricious habit of attempting to fire George for the slightest offense (his bombastic “YOU’RE FIRED! !” has since been copied by Vince McMahon and by Hank Azaria as Mr. Costington in The Simpsons) is another major irritant, though, Spacely would give George his job back at the end of the episode or the beginning of the next episode. In the pilot episode, Rosey defends George and clobbers Spacely with a pineapple upside-down cake, thus resulting in one of the very few instances that Spacely has shown the least bit of humility. George and Spacely’s relationship is more of a mutual dislike for one another than true animosity. Mr. Spacely’s wife is the snooty Mrs. Stella Spacely (voiced by the late Jean Vander Pyl), who henpecks her husband unmercifully. Her favorite catch phrase is when she yells her husband’s name, “COSMO! !” His son is Arthur Spacely (voiced byDick Beals) and his pet dog, Zero. His mother-in-law is Mrs. Meltdown (voiced by Lauri Johnson). Mr. Spacely’s closest (and apparently only) competitor is Spencer Cogswell, the distributor of ‘Cogswell Cogs’, and the one person he actually hates. It was revealed Spacely and Cogswell have been competing with each other since back in the days when they attended the same business school together and competed to be the top student of their class. In the 1980s version, he tended to turn things into competition between his family and the Jetsons, which in many ways, incurred the wrath of George’s wife, Jane. During one episode where both families appeared on a show called Family Fallout (a spoof on the game show, Family Feud), Spacely used every dirty trick and tactic possible to humiliate the Jetsons, which angered Jane. When he attempted to cheat to win, with the aide of ROBO, Rosey, the Jetson’s maid, rectified that situation, causing the Spacelys to become intoxicated. The Jetsons ended up winning a new Foodaracacycle; while the Spacelys received a lifetime supply of Cogswell’s Cogs, much to Spacely’s displeasure and total humiliation. Also, in A Jetsons Christmas Carol, it is revealed that he and George Jetson had known each other since they were young. Previous PostThanks. Hey, I guess they’re right. Senior citizens, although slow and dangerous behind the wheel, can still serve a purpose. I’ll be right back. Don’t you go dying on me!Next PostCan I refill your eggnog for you? Get you something to eat? Drive you out to the middle of nowhere and leave you for dead?